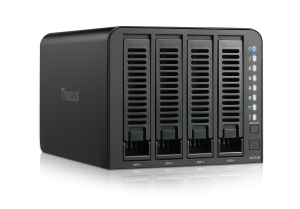 Thecus is pleased to announce the release of the newest addition to its lineup of home, SOHO, and SMB NAS solutions, the N4310. Featuring anAMCC 1GHZ SoC with 1 GB of DDR3 memory, the new 4-bay NAS offers exceptional performance and easy data management at an unprecedented value. Addressing the evolving needs of business professionals pursuing a highly efficient NAS, the N4310 utilizes Hybrid Mode Storage for resource management, AES Data Encryption for added security when dealing with sensitive data, and a built-in FTP server for optimal file sharing. The unit is also equipped with a CPU Offload Hardware Engine, allowing for high performance and speed within a RAID environment (100MB/s read and 75MB/s write speed). For even further security, lockable drive trays come optional; and if you would like peace of mind with power redundancy, the N4310 also supports dual power input. Offering an extensive array of software, including Plex Media Server, a BitTorrent client, and T-OnTheGo mobile support, the N4310 provides a strong platform for multimedia sharing. Beyond these, this latest 4-bay also offers media streaming and smartphone syncing, making it the perfect media data center. Start-up is simplified with our Intelligent NAS utility, which boasts a 5-minute complete installation. Once up and running, the refined ThecusOS 6 provides users with a unique, customizable experience thanks to the rich reservoir of resources found in the Thecus NAS App Center. As a high-performance, low-cost device, the N4310 offers a great array of solutions for all users, from audiophiles with expansive music libraries to the vigorous small business owner with essential financial data. © 2019 Seted Solutions. All rights reserved.